The complex shape of the vertebrae, along with the interaction of central nervous system, the relatively specialized structures of the intervertebral disks and the associated vertebral ligaments has made the description and classification of spinal fractures an ongoing pursuit for the medical community. The current system had its roots in 1963 after Holdsworth proposed classifying spinal fractures by the mechanism of injury (MOI) of compression, flexion, extension, and flexion-rotation. He divided the injuries involvement of the anterior weight bearing column and the posterior “tension bearing” column of facet joints and ligament complex. The 1983 Denis system revision led to a center column comprised of the posterior vertebral body, posterior vertebral disk and posterior longitudinal ligament. This system is still currently the favored method. The main frustration from the Denis method is that the inclusion of the middle column introduced a “virtual landmark” that isn’t really suitable for determining an injury type because it’s not an anatomic entity. A recently developed system by Aebi incorporates the two column method, combined with the method of injury, and the instability which may result in neurological compromise. This method works with grades of severity, increasing from type A to type B and type C. Every type has another subdivision of grade 1 to 3, also going in increasing order of severity. In this way, we have 9 basic injury types which can be even further specified into 27 subgroups of spinal fractures. Obviously the classification of fractures is complicated and ongoing. Lumbar spine fractures, as the name suggests, always locate in the lumbar spine. The lumbar spine is the part of the spine located in the lower back and is an often seen source of pain in physiotherapy. It is situated in between the thoracic and the sacral part of the spine and it is characterised by lordose. The lumbar spine consists of only 5 strong vertebrae, who at the same time are very movable and articularly flexible to give the ability to move the body in different planes like flexion-extension, rotation and lateral flexion. The vertebrae exist of a large anterior body, which bears most of the weight that is placed on the spine, massive dorsal vertebral arches which protect the neural structures (spinal cord) lying inside the vertebral foramen (space between the body and the arches) and several types of processes, on which many muscles and ligaments attach. The other weight bearing structures are the pediculi and the facet joints. In between the vertebrae there are intervertebral discs, which support the weight-bearing task of the vertebral bodies and act as shock-absorbers. Another function of these discs is that they connect the vertebral bodies to each other. The flexion pattern contains compression fractures, and axial burst fractures. The extension pattern, which contains flexion/distraction (often called a chance fracture). The rotation pattern contains transverse process and fracture-dislocation. Nowadays, fractures are divided in type A, B or C fractures. These are actually the same as the ones described above. Although sufficiently powerful studies about the epidemiology of lumbar spine fractures are lacking, several studies acknowledge osteoporosis as the underlying cause of many lumbar fractures, especially in postmenopausal women. Cooper et al. found an age-adjusted incidence rate of 117 per 100,000 in women that was almost twice of that in men (73 per 100,000). Of all fractures, 14% followed severe trauma, 83% followed moderate or no trauma and 3% were pathologic. Incidence rates for fractures following moderate trauma were higher in women than in men and rose steeply with age in both genders. In contrast, fractures following severe trauma were more frequent in men, and their incidence increased less with age. One should keep in mind that this study did not specify the localisation (cervical, thoracal, lumbar) and type of fracture. Failure of anterior column to resist compression. Burst fractures (Type A3) are the most frequent and severe type of Type A fractures. They are characterised by increase of the interpedicular distance and the loss of the height of the vertebral body. There is another subdivision of A3.1 Incomplete, A3.2 Complete and A3.3 Burst split fractures. The complete burst fracture involves both endplates, the superior one as well as the inferior one. 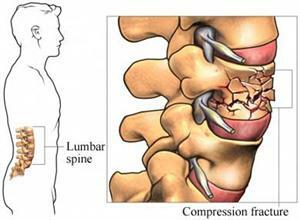 Compression fractures are usually caused by an axial load on the anterior part of the vertebrae. Due to this vertical force, this specific part of the vertebrae will lose height and will become wedge shaped. Axial Burst fractures are also caused by an axial load on the vertebrae, but the difference with the compression fractures is that the vertebra is crushed in every direction and therefore also spreading out in every direction. This implies that this kind of fracture is far more dangerous than a compression fracture because of the risk of the bony margins injuring the spinal cord. These kind of fractures are typically seen in motor accidents or falls from heights. Burst fractures may result in some retropulsion of the vertebra into the vertebral canal. B1-lesions are lesions in which the posterior ligament is disrupted but without involvement of relevant bony elements. The B2-lesions are basically bony seat belt injuries also called Chance fractures. B3-lesions are lesions who are to be found in the anterior column, producing very typical fractures. If this type of injuries remain unnoticed, it may result in progressive kyphosis with pain and deformity. Transverse process (TP) fractures are uncommon and result from extreme sideways bending. These do not usually affect stability. The fracture-dislocation is a fracture in which bone and its accompanying soft tissue will move off an adjacent vertebra. This type is an unstable fracture and may cause severe spinal cord compression. While the listed examples above all imply trauma for a spinal fracture, osteoporosis and conditions such as osteogenesis imperfecta are commonly implicated in vertebral fractures as well. Fractures of the lumbar spine and at the thoracolumbar junction are quite common. Per definition, in compression type fractures the anterior column is affected, whereas in burst fractures, anterior and middle column and sometimes the posterior column, are involved. Compression type fractures are predominately caused by indirect hyperflexion and bending forces whereas burst type fractures result from axial loading. More than 65% of vertebral fractures may not cause recognizable symptoms and may be undiagnosed with radiographs. Patients could have neurologic involvement, may have low back pain, movement may be impaired, or a combination of all of them. When the spinal cord is also involved, numbness, tingling, weakness, or bowel/bladder dysfunction may occur. A useful tool for the classification of thoracolumbar injuries is ‘the TLICS classification system’. Recent studies have raised concerns regarding the reliability of both the Denis and the AO systems, which have been previously mentioned. Both systems have moderate inter- and intra-observer reliability, due to the complex subtypes within each system. This shows that increased complexity of the classification system often leads to less reliability in the clinical setting. The Thoraco-Lumbar Injury Classification and Severity (TLICS) scale, developed by the Spine Trauma Study Group (STSG), works with three “primary axes”: (1) injury morphology, (2) integrity of the posterior ligamentous complex (PLC), and (3) neurological status 32. The three primary axes are further divided into a limited number of easily recognizable subgroups, further defining a particular injury from least to most significant 33. The interpretation of the TLICS severity score is simple. Lesser point values are assigned to the less severe or less urgent injuries and greater point values are assigned to more severe or more urgent injuries. In general, severity is used to indicate the extent of injury to the bony and ligamentous elements of the spine 31. The TLICS system has proven helpful in guiding surgical treatment. The scores of the 3 primary axes are summed to yield a total severity score. This score can generally predict the need for surgical intervention. Generally speaking, a total score >5 requires surgical treatment whereas a score <3 can be treated nonoperatively. The reliability and the validity have been investigated extensively. Since the introduction of the classification system it underwent a series of modifications. The most recent version of the system has proven to be both valid and reliable by multiple studies, Rampersaud et al. (2006) performed a multi-center reliability study which shows that the TLISS establishes a consensus-based algorithm for treating thoracolumbar injuries. Patel et al. (2007) also showed the validity of the system in a prospective study. The main goal of this study was to evaluate the time-dependant changes in inter-observer reliability. They found that there was a substantial improvement at the second assessment, this suggests that the classifications system can be taught efficiently. There are even more studies analyzing the reliability and the validity and all show positive results. Therefore we can conclude this system can be incorporated in daily practice 31. = Disabling pain in and around the coccyx that may radiate to the lumbar spine. Only pressure point pain is present. = Degeneration and arthritis of the facet joints of the lumbar vertebrae. Plain anterior-posterior, lateral and oblique X-ray films should be made and examined. CT scans can obtain more information about not only the facet joints but also other structures of the spinal segment. = Any type of back pain in the lumbar region that is not related to serious pathology or does not have a specific cause. Once serious spinal pathology and specific causes of back pain have been ruled out, the patient is classified as having Non-Specific Low Back Pain. = A process in which the intervertebral discs of the lumbar region lose height and hydration. = A uni- or bilateral bony defect in the pars interarticularis or isthmus of the vertebra. = A translation of one vertebra over the adjacent caudal vertebra. = A disease characterized by a decrease in bone density (mass and quality). To asses if the treatment is working or has worked one can take an x-Ray and evaluate the bone mineral density. Subjectively a therapist notices progression with various tests that determine the ROM and strength. The measurements can also be taken by other tests which are presented in point 5. When confronted by an acute case of a lumbar fracture the patient needs emergency treatment because the extend of the injury is not known. A doctor should do a full body exam to make sure the fracture didn’t cause any other damage. It is of grave importance the doctor performs neurological tests as well as imaging tests. The neurological tests evaluate if the patient has suffered damage tot the spinal cord or nerves that originate in the lumbar region. the tests consist of moving, feeling and sensing the limbs in different positions and testing of the reflexes of the patient. Radiologists should take a proactive role in helping to diagnose spinal fractures. The failure to diagnose vertebral fracture is a worldwide problem due in part to the lack of fracture recognition by radiologists and the use of ambiguous terminology in radiology reports. The effect of this procedure on osteoporotic vertebral compression fractures was analysed by R. Takemasa et al. and found no demonstrable clinically important benefits compared with a sham procedure. Focus on strengthening transverse abdominals. Stabilization is increased through multifidus, transverse abdominal and oblique contraction. This exercise works both the core and back muscles, hitting the TA, multifidus and quadratus lumborum. Thoracolumbar fracture therapy evidence closely parallels that of the lumbar spine and other exercises can be seen here Thoracic_Spine_Fracture. Even the very moderate amount of exercise that is recommended for general wellness (a minimum of 30 minutes on most days) is helpful in preventing osteoporosis and maintaining bone density. Lumbar spine fractures, whether from an acute injury or progressive in nature like osteoporosis, occur often enough to merit adequate research with regard to healing procedures. A great deal of inquiry has gone into spinal surgery options, while very little appears to exist for specific physical therapy management. Most of the present information acknowledges that physical therapy, especially that of therapy and bracing can just as effectively manage lumbar fracture pain (without neurological involvement) as that of surgery. However, no current research exists that effectively compares the most effective therapy. Current recommendations revolve around basic core and lumbar spine strengthening as with most lumbar spine insults. It is our recommendation that more research be done in this area that focuses specifically on lumbar spine fractures and the most effective therapy treatments for these injuries. Holdsworth FW. Fractures, dislocations and fracture/dislocation of the spine. J Bone Joint Surg Br 1963;45:6-20. 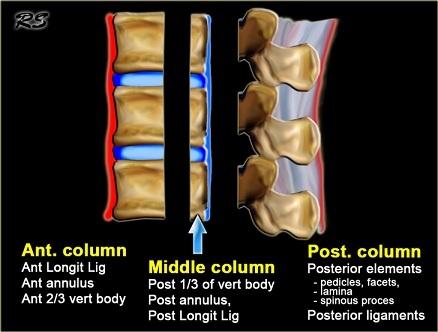 Denis F. The three column spine and its significance in the classification of acute thoracolumbar spinal injuries. Spine 1983;8:817-31. Aebi M. Classification of thoracolumbar fractures and dislocations. Eur Spine J 2009;19:(suppl I):S2-S7. American Academy of Orthopaedic Surgeons (AAOP). http://orthoinfo.aaos.org/topic.cfm?topic=a00368 (accessed 27 April 2011). Lentle B, Brown J, Hodsman A, et al. Recognizing and Reporting Vertebral Fractures: Reducing the Risk of Future Osteoporotic Fractures. Canadian Association of Radiologists Journal [serial online]. February 2007;58(1):27-36. Available from: Academic Search Complete, Ipswich, MA. Accessed May 1, 2011. Heary R, Kumar S. Decision-making in burst fractures of the thoracolumbar and lumbar spine. Indian Journal of Orthopaedics [serial online]. October 2007;41(4):268-276. Available from: Academic Search Complete, Ipswich, MA. Accessed April 14, 2011. Lenchik L, Rogers LF, Delmas PD, et al. Diagnosis of Osteoporotic Vertebral Fractures: Importance of Recognition and Description by Radiologists. Am J Roentgenol Radium Ther Nucl Med. 2004;183:949-58. Stadhouder A, Buskens E, de Klerk LW et al. Traumatic Thoracic and Lumbar Spinal Fractures: Operative or Nonoperative Treatment: Comparison of Two Treatment Strategies by Means of Surgeon Equipoise. Spine 2008;33(9):1006-17 LoE:2b. Yamane, T., T. Yoshida, and K. Mimatsu. 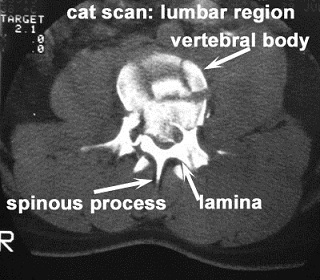 "Early diagnosis of lumbar spondylolysis by MRI." Bone & Joint Journal 75.5 (1993): 764-768.